Long considered one of the key books on the well-informed audio engineer’s shelf, Sound System Engineering provides an accurate, complete, and concise tool for all those involved in designing, implementing, and testing sound reinforcement systems. This new fourth edition includes eight new chapters leading the reader through both cutting-edge topics—e.g., IBM’s proposed thought-controlled sound system—and solid basics, such as loudspeaker specifications, wave equations, and digital audio. Packed with numerous illustrations and useful appendices, this is a concentrated capsule of industry standards and knowledge that spans the complete range of sound systems, from the simplest all-analog paging systems to the largest multi-purpose digital systems. 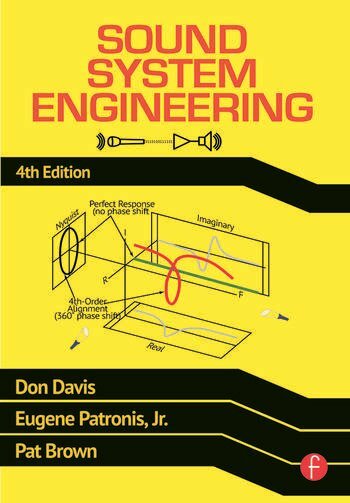 Chapter 1 Why Sound System Engineering? Don Davis and his wife, Carolyn, founded Synergetic Audio Concepts in 1972. Don and Carolyn are both Fellows of the Audio Engineering Society. Don is a senior member of the IEEE and a gold member of the Acoustical Society of America. Don and Carolyn received dual lifetime achievement awards from NSCA, the Adele De Berri Pioneers of Audio award from InfoComm International, and the USITT Harold Burris-Myer Distinguished Career in Sound Design Award. Both Don and Carolyn were recipients of Indiana’s highest citizen award from the Governor when they were made Sagamore of the Wabash for their contributions to education. Eugene Patronis, Jr., taught in the School of Physics of the Georgia Institute of Technology for over fifty years. Throughout his tenure he participated in academic research and industrial consulting in the fields of experimental nuclear physics, acoustics, and electronics. He is the author of several patents in audio related topics. Pat Brown is the president of Synergetic Audio Concepts, Inc., and of Electro-acoustic Testing Company, Inc., both of Greenville, Indiana. He teaches audio engineering seminars worldwide, and develops web-based audio training programs. His background as a musician, sound contractor, and electronics technician and consultant has forged his practical approach to solving audio and acoustic problems.